Mind mapping software is supposed to help you brainstorm ideas, plan projects, and scope out big concepts, but building the mind map itself isn't always intuitive or easy. 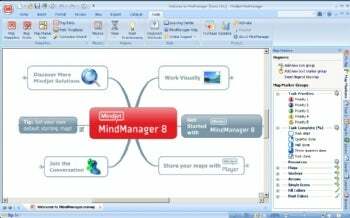 MindManager 8 ($349) from Mindjet takes most of the guesswork out of turning a bunch of disparate concepts into a tangible plan by giving you the ability to drag map components from a palette of options into your map. The components "stick" together, rapidly developing the map from its constituent parts. Better yet, MindManager works with common office applications such as Outlook and Excel, helping you spread your vision into the rest of your workflow. Mindjet's MindManager 8 is one of the most attractive mind mappers--and one of the easiest to learn. The program steps you through the process of building a map, easing you through the process if you've never created one before. In a series of steps, MindManager prompts you through the steps involved in brainstorming, from coming up with the various parts of your map, to building groups that can be used to classify and begin a process of organization. Once you've built the essential framework of your mind map, MindManager lets you further customize the appearance and structure, from the shape of the lines that define relationships to the direction the program "grows" the map when you add subtopics or sub-categories to the map. No matter how complex, the program manages to build your mind map into a clean, well-organized plan, and can integrate databases, images, spreadsheets, and can even output Outlook to-do list items. In fact, the more time you spend with the product, the more useful features you're likely to encounter. At $350 for a fully registered version, MindManager isn't cheap. In fact, the product is one of the priciest mind mapping tools available. While it can't build wacky, three-dimensional maps like 3D Topicscape Pro, and isn't free (both as in freedom and as in beer) like the open-source FreeMind tool, MindManager has a lot to offer. And since you get 30 days to give it a try, you might as well give the Cadillac of mind mapping tools a thorough test drive.